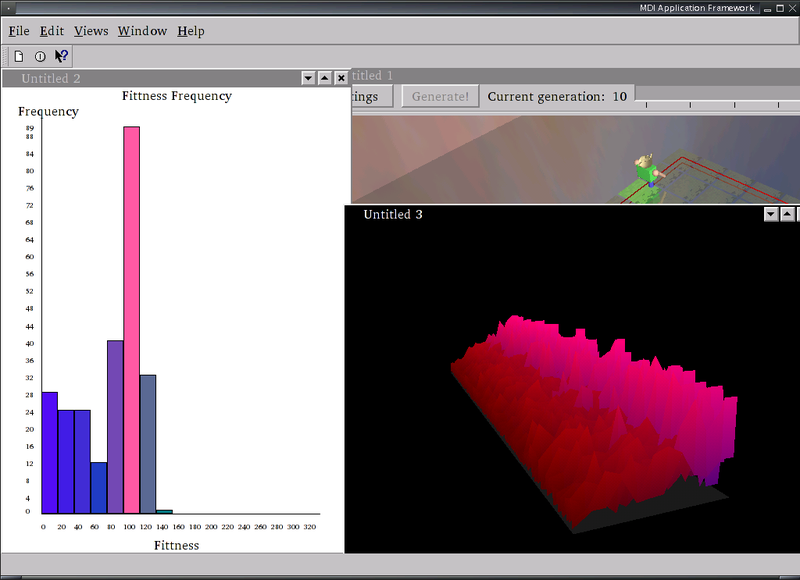 This is a GUI frontend to the genetic programming assignment given in this subject. The aim is to evolve a wall-following robot. The program provides multiple visualisations of the process. It was written with Janice Leung - many thanks for the beautiful widgets! Developed on (but not for) Linux using Python and its bindings & add-ons: PyQt, PyOpenGL, PIL and psyco. README available. It contains more information about the code used to render the robot & world. another view of the interface with the views resized. COMP3141 'Software System Design and Implementation' was run by Amir Michail of CSE at UNSW, Sydney. I hope this code helps you better understand these concepts and/or teaches you new things, as it did me! tree graphs looking like the nodes had been 'crossed over' too. without yielding to other tasks, it is not a good solution that would ensure GUI responsiveness. Thus this interface is created to enable iterative evolution over a custom 'step size'. events after which it can run the next iteration, and so on, until it finishes the entire process. This is the settings dialog which allows user to enter the info as described in the assignment spec. ChildFrame. These settings are saved along with the document. continue running the evolution from where it left off (allowing continuity). When this is clicked, the setting dialog will pop up and allow the user to set the info. When this is clicked, the program will generate the population as specifed in the settings. has to click it again to finish the rest of the run. This shows the current generation number and will be updated as the evolutionary simulation is progressing. and the individual list in the VisualisationControl area will be updated with the new generation's individuals. 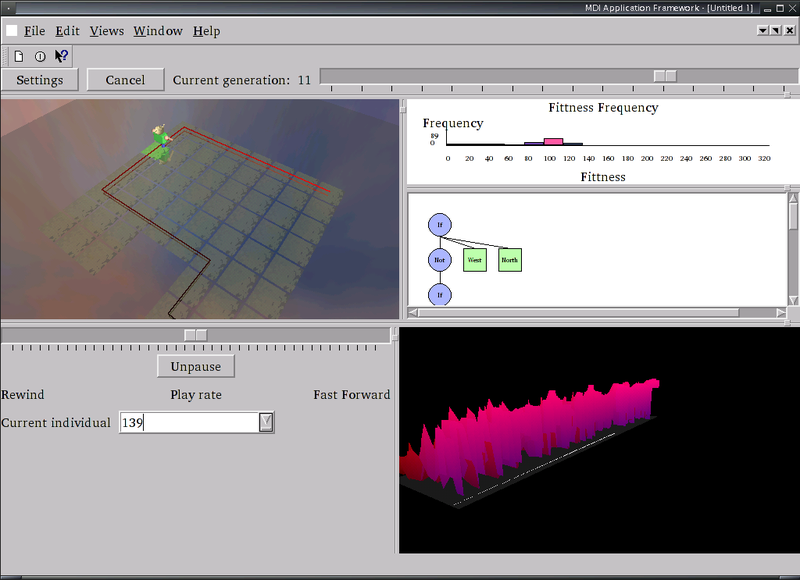 This is a 3D visualization of the map and the robot. or when a new starting position is selected, or when a new individual is picked). by simply clicking on the tile in 3D. Controls: Click/select with Left mouse button. The animation/particle system is taken care of by timers set in the widget. They cause the engine to tick over and move the robot/particles. positions it walks across as it goes). fittness values (depending on the number of bars on the graph) will be added up and stored in a list. The height of each bar will be depended on the values in the list. QPainter has been used in drawing the histogram and QPixmap to store the picture after it has been painted (increased re-draw time). node will be moved accordingly to the right. QPainter has been used in drawing the tree and QPixmap to store the picture after it has been painted (increased re-draw time). if that sensor node is active as the robot walks across the map. Resizing is automatic (depending on the tree size) so the widget is embedded in a scroll view for easier viewing. can be fast forwarded (to the right of centre), rewound (to the left of centre) or stood still (middle, or click 'Pause'). If Paused, click Unpause to resume with the last rate setting. 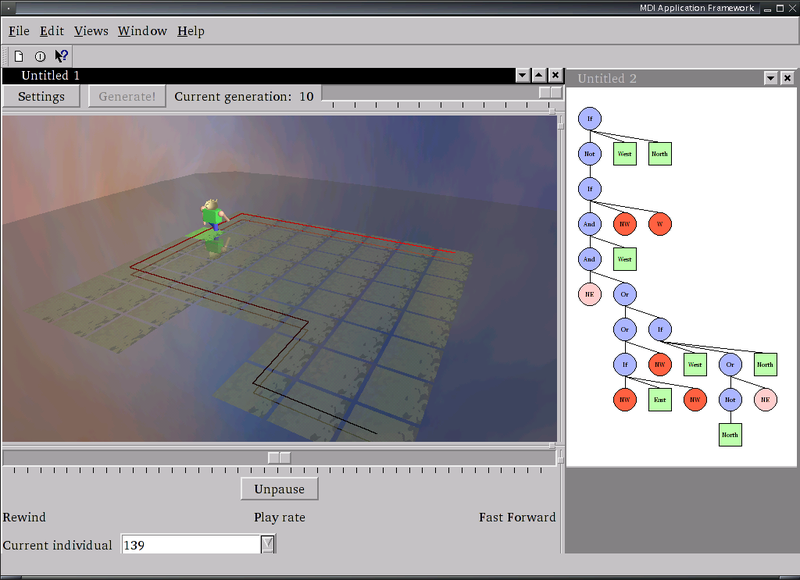 different tree will be displayed and the robot will move according to the new individual's program tree. (The robot will start moving from the same startin position as the previous tree unless a new one is set). This is a 3D graph with generation as the z-axis (depth), individual as the x-axis (going across) and fittness as the z-axis (going up). The camera controls are the same as the RoomView. 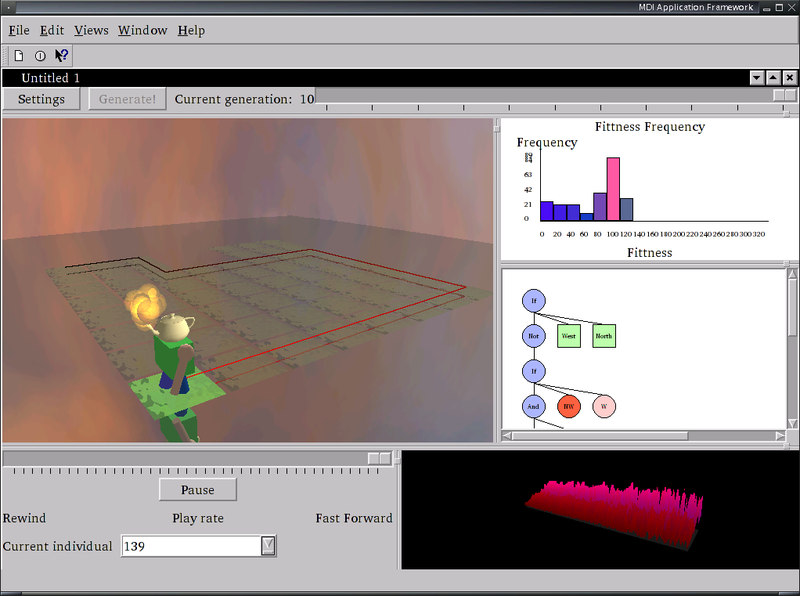 OpenGL was used to render the 3D graphics. (PyOpenGL bindings to make it work in Python). for use of alpha (tranparency) maps. rotational transforms on certain objects to make it's arms/legs move. 3D data (including references to used textures). on the scene can be called to make it display on screen. (replacing the existing character) and the new model would appear - no change to the code is necessary!